The Val di Sieve was formed by the River Sieve which joins the River Arno at Pontassieve, Tuscany, Italy, flowing from a valley that extends into the hills abutting the Mugello area, towards the Apennines. 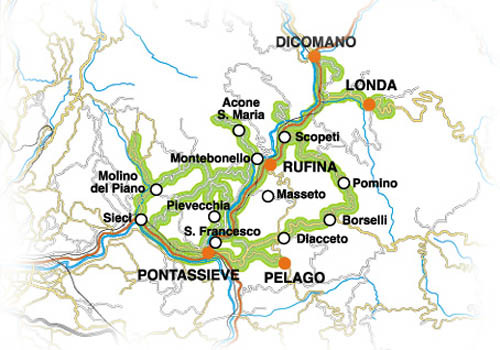 The Chianti Rùfina DOCG and Pomino DOC wine zones are located here, and the "wine roads" of Chianti Rufina and Pomino run up the valley, with excellent wineries to be found from Pontassieve to Pelago, Rùfina, Londa and Dicomano. Florence is just a few km. away and easy to reach. Click here for vacation accommodation in and near the Val di Sieve. The bridge known as Ponte della Sieve (1555), mainly of brick, from which Pontassieve derives its name, crosses the Arno, carrying the old road connecting Florence to the Mugello, the Casentino and Valdarno towards Arezzo. It has been destroyed and rebuilt more times, most recently during WW II when Pontassieve, an important railway junction, was heavily bombed. The town of Pelago lies between the rivers Sieve and Arno. An "On The Road Festival" takes place in the city centre every year in July - a multicultural event with buskers, musicians and artists of every kind. For more than a century, the town of Rùfina has been linked with the homonymous Chianti wine and Villa Poggio Reale (16 C) houses an interesting Wine Museum. In Londa a deep scent of ripe peaches alternates with the scent of wine in September, during the harvest. The famous peach, called Autumn Queen, has been cultivated here for more than fifty years. The Festival in September takes place every year, with games, shows and events dedicated to this peach. Dicomano has always been an important road junction: from the main square different roads lead to Florence, the Casentino and Romagna. San Godenzo lies in the middle of the Casentino Woods Nature Park, between Mount Falterona and Mount Campigna. Dozens of paths have been created for trekking and mountain bike excursions. The Acquacheta waterfalls are accessible, as well as the Mount Falterona, which the Etruscans believed to be the father of the river Arno. Vorresti pubblicizzare la tua attività su questo sito web per la Val di Sieve e ricevere traffico in entrata dalla nostra rete di più di 50 portali relativi? Clicca qui per ulteriori dettagli in merito alla nostra soluzione integrata per una presenza su internet piena di successi. Val di Sieve © ammonet InfoTech 2008 - 2018. All rights reserved.